The Dublin Assay Office was established in 1637 to supervise the assaying of all gold and silver in Ireland. Located in Dublin Castle, the office serves as a consumer protection agency, and the hallmarks given are accepted worldwide. 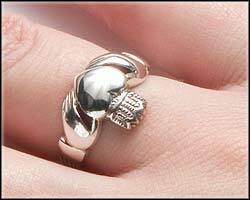 All Celtic fine jewelry from Celtic By Design bears these hallmarks as your assurance of quality and authenticity. The Hibernia is the official mark of the Dublin Assay Office. This mark features the profile view of a woman (Hibernia) in olden dress, together with a harp (the national symbol of Ireland). 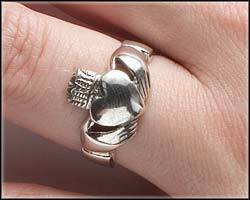 All jewelry receives this mark in the form of a stamp, with the exception of very delicate pieces. For those, laser marking is sometimes used, or the hallmarking stamps may not be used at all. This mark has changed over the years, but the Hibernia is the current standard of all pieces hallmarked in Ireland today. Where, for example, the “10” indicates 10K and the purity is 417 parts per thousand, etc. Other marks may also appear on the piece, such as the maker’s mark, a fineness mark, or a letter indicating the year in which a piece was hallmarked. The letter cycle assigns a new letter each year, but inclusion is optional. 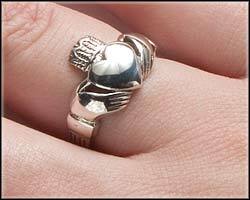 Items are generally sent to be hallmarked before their final polishing. This is done to protect each piece from the marking process itself. This can sometimes make hallmarks slightly difficult to read depending on the amount of final polish needed. Should any item fail the purity requirements for hallmarking, the piece is either hallmarked at the next lower grade or is returned to the manufacturer with no hallmark for recycling. The Origin Of The Wedding Tiara Today, the word ‘tiara’ evokes elegance, beauty and feminine splendor and is used to mean a jeweled, ornamental crown worn by women, especially during a formal occasion, such as a wedding. Actually, the term is thought to have originated in Persia (somewhat equivalent to present day Iran) and was the the word used for the high peaked headdresses of Persian kings. By the late 18th century, the tiara was exclusively a female ornament, exemplified by Napoleon, who gave his wife Josephine many of these bejeweled gifts. Many of the world’s most beautiful tiaras have been owned and worn by the queens and princesses of royal families. The largest and most valuable collection of tiaras in the world belong to Great Britain's Queen Elizabeth II, and she often wears one of these heirlooms on state occasions. There is a lovely story of the Queen’s first tiara, as this favorite piece was a gift from Queen Mary, Elizabeth’s grandmother, on the occasion of Queen Elizabeth’s wedding in 1947. Queen Mary herself had received the tiara as a gift from the Girls of Great Britain and Ireland for her wedding in 1893 to the Duke of York, later George V. The Royal Family of Sweden also has a magnificent collection, as do the Royal Families of Denmark and Spain as well as the Dutch Royal Family. In the United States, tiaras gained popularity among wealthy women who were not of royal lineage, including Mrs. William Astor, Mrs. George J. Gould and Mrs. W.K. Vanderbilt. The 1920’s then ushered in the ‘flapper’ era which enhanced the popularity of tiaras, this time made of costume quality jewelry, and they were widely embraced as the fashion of the day. But personally, I think the popularity of the tiara as a wedding headdress was sealed when Princess Diana wore the Spencer tiara, from her own family lineage, in her wedding to Prince Charles in 1981. Even after the wedding, Diana was quite fond of the Spencer tiara, and wore it often to events. So naturally, after her untimely death, the tiara became a symbol of sorts, for beauty and grace and a lovely woman whose time was tragically cut short. Kate Middleton also wore a beautiful tiara on the occasion of her wedding to Prince William, which was later placed on display in Paris as part of Cartier exhibition at the Grand Palais. For Royal weddings, the custom was for the bride to wear a tiara from her own family for the ceremony. According to Geoffrey Munn, the foremost expert on tiaras, the tiara symbolized the coming of age and the loss of innocence to the marital bond. There was a definite tiara etiquette for wearing the headdress; the time of day, which events were acceptable and so forth. The wedding of Charles and Diana marked the end of the era of this unspoken tiara protocol. Today’s brides can easily find replicas of the Spencer tiara as well as replicas of the Cambridge Love Knot tiara, which was given to Diana by the Queen on her wedding day. Many modern wedding tiaras feature sparkling Swarovski crystal flowers, leaves, and other designs. If you are an Irish bride to be, there is no better way to honor your heritage than a beautiful wedding tiara, such as this 18K gold plate Irish Wedding Tiara graced with Irish Celtic Trinity Knots and filled with Austrian crystals. Or choose an Irish Wedding Crown with this delicate Irish Bridal Tiara graced with Irish Shamrocks and Celtic Trinity Knots. Even if you don’t have a drop of Royal blood, you’ll be the Queen of your wedding day!